BACARDÍ rum wants you to enjoy the summer! They are helping you cool off by creating a specialty cocktail, The BACARDÍ Red Rum Punch. Now you can beat the heat with BACARDÍ rum’s newest released flavor, BACARDÍ Raspberry! 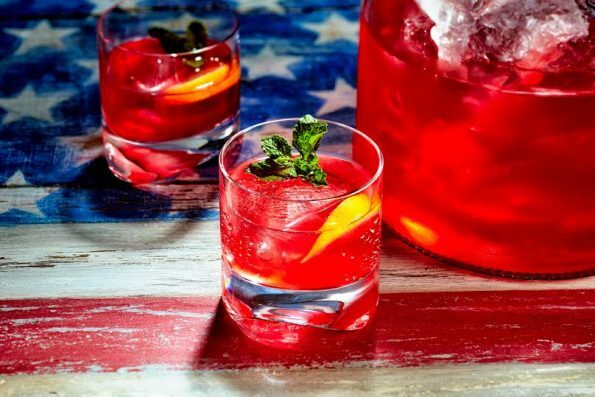 The BACARDÍ Red Rum Punch is made with tasty berry and citrus ingredients, and the bright red color makes it perfect for your summer Instagram photos. Top it off with a sprig of fresh mint and a lemon slice for a beautiful garnish that complement the rum’s flavor profile. Don’t feel like running to the store for any missing ingredients? Make your entertaining easy this summer by ordering the BACARDÍ Red Rum Punch on-demand via Cocktail Courier, the premiere online cocktail delivery service. Cocktail Courier delivers BACARDÍ cocktails straight to your doorstep, in perfectly proportioned ingredients – making mixing up cocktails simple all season long, and leaving you with more time for enjoying the long summer nights! Combine all ingredients in pitcher filled with ice. Serve with mint and lemon garnish. In 1852 an earthquake destroyed Don Facundo Bacardí Massó’s business. While most would give up, this only made him more determined, and he set about pioneering a process that would far surpass the crude local rum known as ‘aguardiente’ (firewater). His method produced a rum that was balanced and light. From tragedy came his legacy; BACARDÍ rum. Don Facundo Bacardí Massó isolated a single strain of yeast; La Levadura BACARDÍ, which became the key to the consistent flavor of BACARDÍ. With this discovery he ensured that the unique flavor profile of his rum would be the same today as it was over 150 years ago. It remains the company’s most precious asset. Don Facundo Bacardí Massó was the first rum maker to pioneer particular methods used by whisky and French XO producers. He found that lightly charred American white oak barrels greatly developed his rum’s flavor, aroma, smoothness and colour. It was a test of patience, but well worth the wait. The Maestros De Ron BACARDÍ, taste the rum at every single step of the process, blending it into the delicate, balanced liquid that is BACARDÍ rum. This ensures that every drop tastes exactly as Don Facundo Bacardí Massó crafted it over 150 years ago, a legacy that will continue to be passed on through each new generation of Maestros de Ron BACARDÍ.